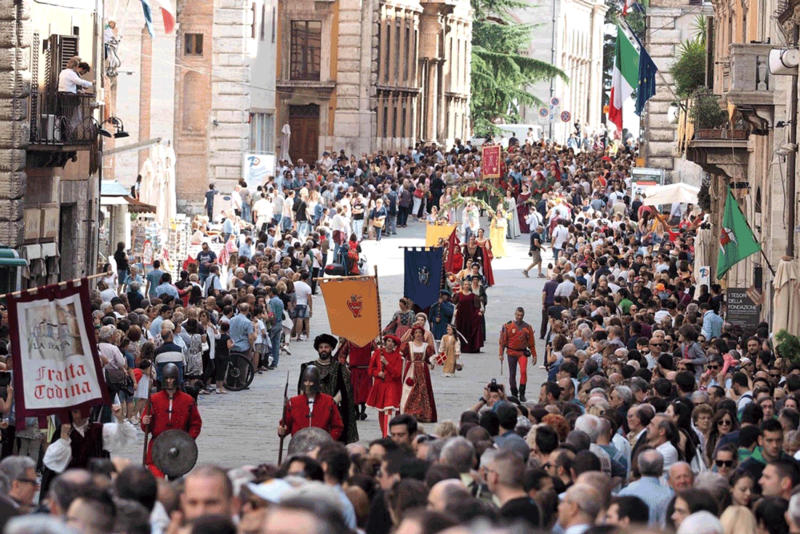 Join us for a Perugia 1416, a festival filled with events, costumes, parades, music, and food. 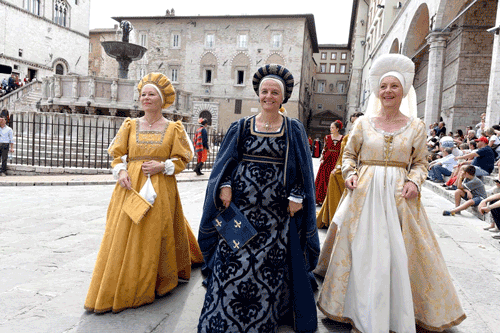 In this third annual edition, the medieval streets of Perugia, Umbria’s capital, will host its largest costumed event ever. Parades, spectacles, a joust, and so much more. Why the title Perugia 1416? The date is not arbitrary. It commemorates a turning point in the history of Perugia and marks to end of the Medieval era and the beginning of the Renaissance here. In that year Braccio Fortebracci of Montone (a beautiful town in northern Umbria, just above Umbertide) entered the city and became its ruler. 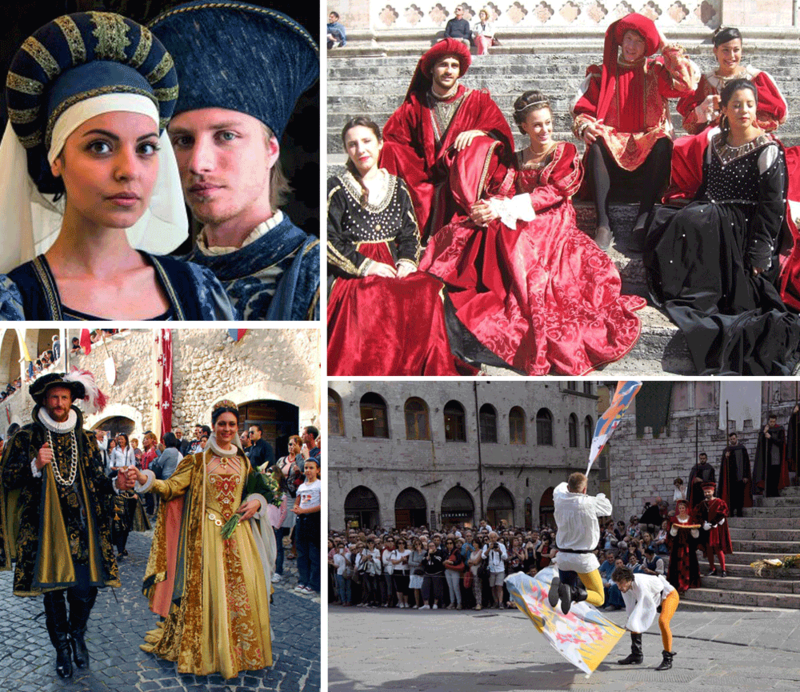 Perugia 1416 celebrates the unity of all the people of Umbria at this specific period. Residents and members of various districts stage events throughout the weekend. Costumes are certainly the highlight of the event with everyone from nobles to peasants being in attendance. The streets of Perugia, filled with the sights and sounds of our distant past, are a wonder to behold and a whole lot of fun. Come, spend a week with us and experience, not only this great event, but discover the best Umbria has to offer. Week long packages for groups of as few as 4 people. Packages include everything from pick up and dropoff at Rome’s Fiumicino airport, meals, daily tours, and accommodations in a wonderfully restored 17-century palazzo in the beautiful walled hill town of Bettona. Your American host is happy to pull out all the stops and make your holiday exactly as you’d like. In addition to spending time at Perugia 1416, you’ll have the opportunity to visit to Assisi, Bevagna, Montefalco, Spello, Spoleto, or Orvieto, to name a few of our beautiful towns. Maybe a truffle hunt, wine tastings, or cooking lessons are what you’d like. Yes, you can do all that too. Customized tour packages available from mid-April till mid-November.